Mouse appreciates her new smooth smile! 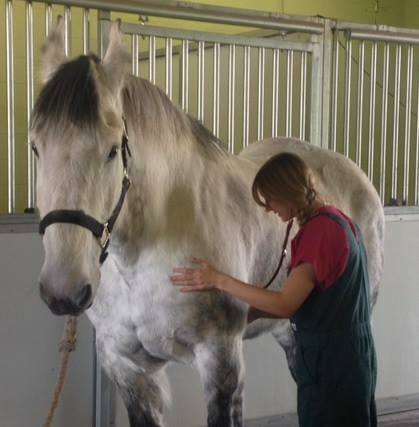 Spring check-up and vaccines for this big beauty! Associated Veterinary Medical Center in Walla Walla, WA is a full service animal hospital. It is our commitment to provide quality veterinary care throughout the life of your companion animal. Our services and facilities are designed to assist in preventive care for young, healthy animals; early detection and treatment of disease as your companion animal ages; and complete medical and surgical care as necessary during his or her lifetime. We understand the special role your animals play in your family and are dedicated to becoming your partner in your companion animals health care. Our goal is to practice the highest quality medicine and surgery with compassion and an emphasis on client education. Our entire healthcare team is committed to providing personal attention to the unique concerns of each individual animal owner. Dr. Campbell grew up in the Eastern Oregon town of Heppner. She graduated from Oregon State/Washington State University in 2003. 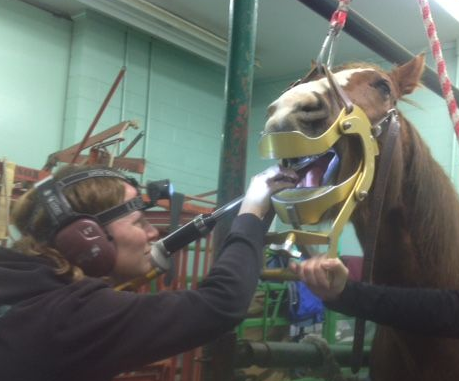 Dr. Campbell completed an Equine Internship at Bend Equine Medical Center which is a private referral/surgical practice in Bend, Oregon. Dr. Campbell joined Associated Veterinary Medical Center in 2004. Dr. Campbell and her husband Tygh live in Athena with their two daughters Kaci and Charli. As a family they enjoy rodeo, horses, and are actively involved in the Pendleton Round Up. Dr. Perkins graduated from the University of California, Santa Barbara with a double Bachelor of Arts in Biological Sciences and Geography. During her undergraduate studies, she spent one year in an Honors Program Studying Abroad at the University of Glascow in Scotland. Dr. Perkins enjoyed the year in Scotland and elected to attend and AVMA approved Veterinary School at the University of Glascow. 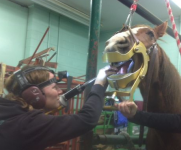 In 2002 Dr. Perkins graduated with Merits in both small and large animal medicine. After returning to the US, Dr. Perkins worked in Central Oregon as a mixed animal veterinarian until 2010 when she joined the team at AVMC. Dr. Perkins and her husband Casey live on the family wheat farm in Athena. They are busy at home with their sons Colby and Finley. Dr. Benson grew up in Bellevue, WA and earned her undergraduate degree in biology from Montana State University in Bozeman, MT. She worked as a veterinary technician in Bozeman, enjoying the snow and mountains, before attending Washington State University to earn her Doctor of Veterinary Medicine. During her years at WSU, she developed a passion for small animals, including small ruminants and camelids. Dr. Benson is certified by the Chi Institute of Chinese Medicine as a Veterinary Acupuncturist. Dr. Benson enjoys spending time outside, hiking, skiing and playing at the park with her husband, son and two dogs. Dr. Wicks grew up in Southern Oregon on a small family farm. At Oregon State University, she worked at the sheep and equine barns, trained in the colts-in-training program, and volunteered with a local equine therapy group. She then went on to veterinary school at the University of Tennessee where she discovered her passion for reproductive work and small animal medicine. Dr. Wicks practiced in Nashville, Tennessee for four years before moving here to Walla Walla. Her husband was born and raised in Hermiston, Oregon, and they are very excited to be joining and serving the Walla Walla community. Dr. Wicks and her family enjoy crossfit, yoga, fishing, hunting, and kayaking.